Starting from Puerto Varas, first drive south to Puerto Montt. This is the southern end of the long (3364 kilometer) north-south motorway in Chile (Hwy. 5). From Puerto Montt, continue SE along the coast on Hwy. 7. After a rather short drive, turn left at Puente Chamiza, road signed for Lago Chapo. Left again near Correntoso, still sign for Chapo. Shortly, there is a last left fork, with signs for Cascades and Volcan. Drive until you see the Marine Harvest facility (Norwegian fish farming company), then park on a large parking area on the right hand side. This location is S41.39458, W072.63922, elevation about 400 meter. Walk back up some wooden steps towards the Marine Harvest fence, then pick up a large trail that follows around on the right hand side. This trail has several information signs and is partly a board-walk. After about 15 minutes, having climbed a small slope, you arrive at the park HQ., several small buildings, one being the Conaf office. It is not open early in the morning, but they appreciate if you leave a note (with names) in the door. 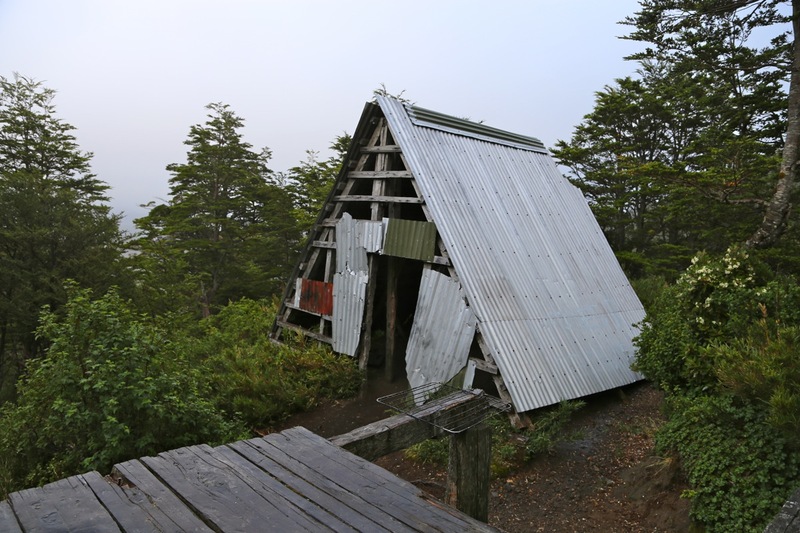 From here, the trail continues to the Calbuco shelter, two pretty useless buildings with zero facilities. From the shelter, the trail descends slightly, then begins a rather steepish climb that is quite slippery when it rains. Once above the vegetation, the trail runs more conveniently in climbing zig-zag turns, then crosses a permanent snow field. The slope at the crossing point is gentle, we had no problems crossing without crampons/ice axe. One may also just continue uphill and merge with the route higher up. 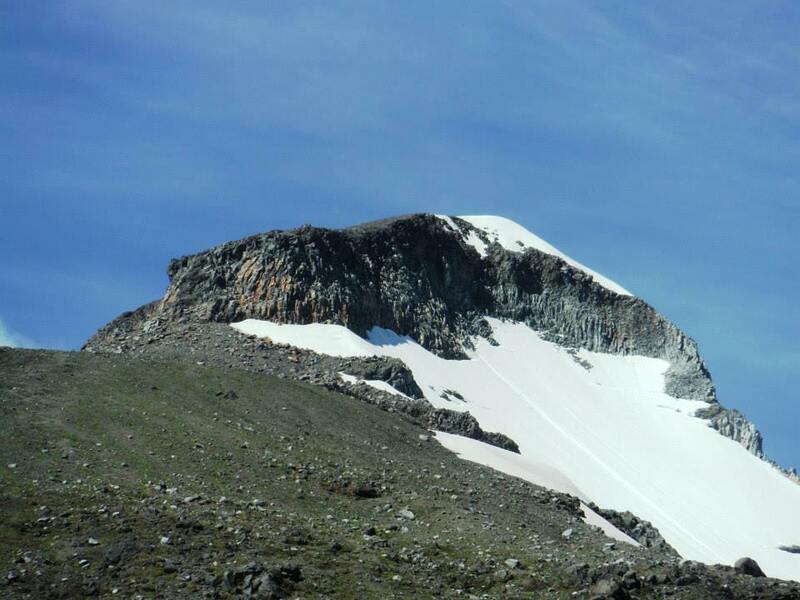 Above the snow field, the trail arrives at the base of a cliff band. Traverse a few meter left (around a corner) to location S41.33380, W072.62278, elevation about 1825 meter. This is the start of a 30 meter climbing section. Start up axcross easy slabs, then enter the bottom of a chimney. Climb up here and gain a small shelf on the right hand side. From here, traverse left (around a block) to gain easier ground. There remains a last step, then find good rocks that supports a belay stance. Note that the final move will get you onto a slope with many loose rocks. Some of these will likely fall down the climbing route, your party below should be prepared (wear helmets!). From the top of the climbing section, the route continues a zig-zag climb up the remainder of the summit ridge, gradually less steep. 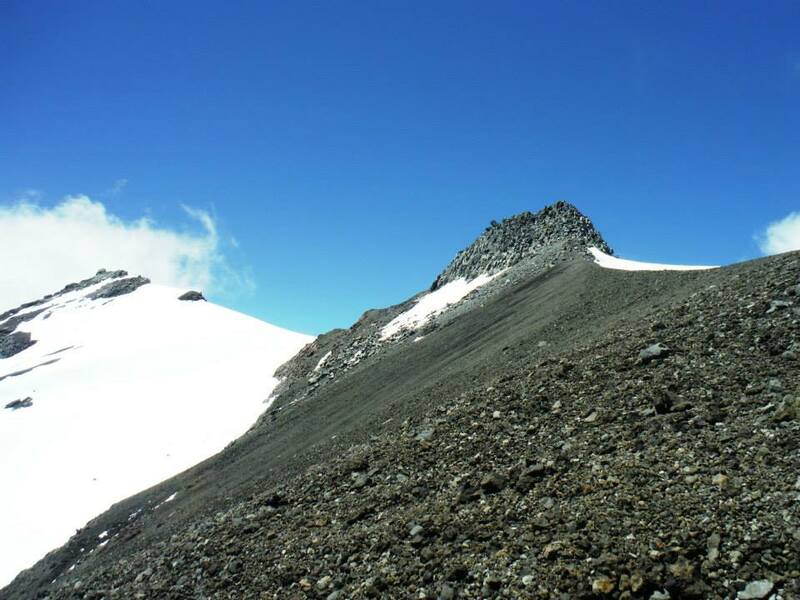 Finally, one arrives at a summit pyramid made up from large boulders. Scramble this carefully, slightly to the right hand side, in order to gain the highest point. 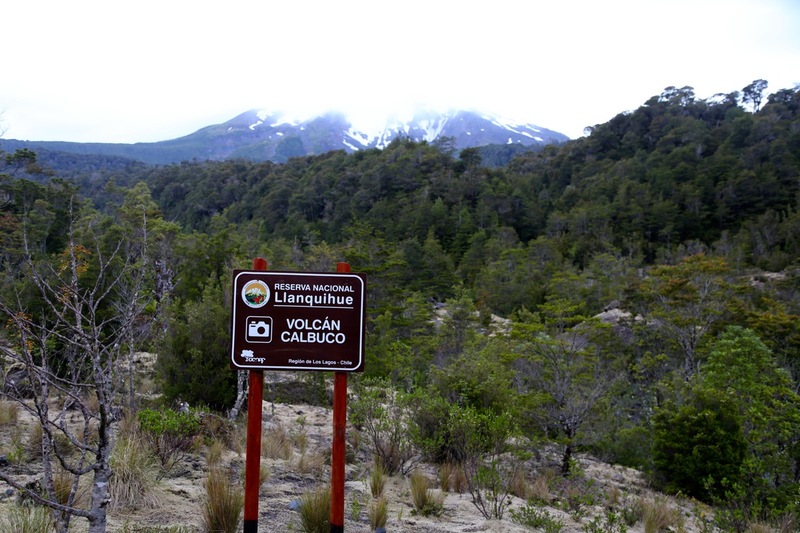 The forecast for this Monday called for rain, however it was the last realistic day to climb Calbuco, since the forecast for Tuesday was even worse! Only Wednesday promised good weather, but then we needed to be back north in Temuco to catch our evening flight to Santiago. Thus, we had set the alarm to 0415, hoping that an early start would get us high (or even off?) the mountain before the weather would arrive. Navigation to the trailhead was easy and we arrived there when it was still dark, slightly before 0600. After a bit of organizing and preparing the backpack, we set off at 0615, still a bit dark so a small torch was used initially. We noticed the Marine Harvest facility (Norwegian company), then picked our way around it and up to the Conaf hut/office in about 15 minutes. Nobody there, as expected. We wrote a small note and left it at the office door. We also took advantage of the drinking water tap located immediately outside the building. 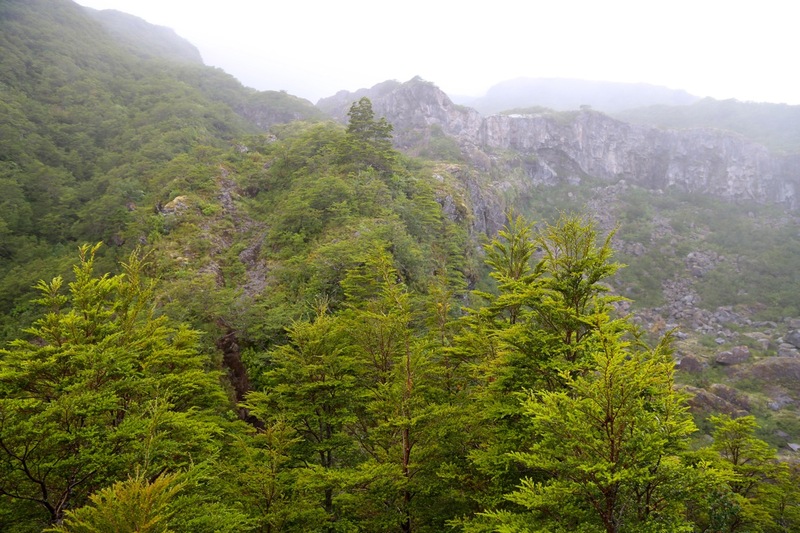 It was now light and we continued along the rather nice and well marked trail to the Calbuco shelter, arriving there at 0815, so 2 hours with a good pace set by Pål Jørgen. 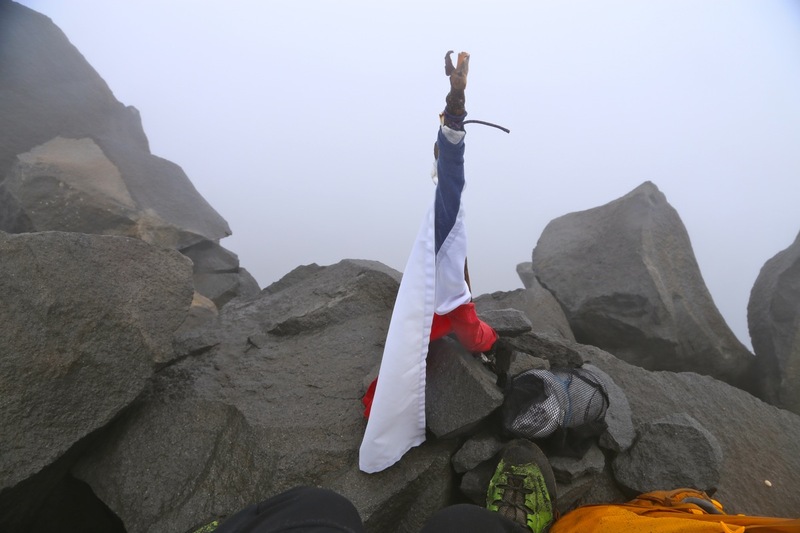 It had already started to rain and our goal, Calbuco, was never visible in the clouds/fog that prevailed. After a short break, we continued up the rather steep trail, now slippery because of the rain. Conditions improved as we got above the vegetation, a trail with just soil surface, gets very slippery when steep and wet. We followed the trail and crossed the snow patch easily without trouble, the slope is quite moderate where the trail crosses. Ascending on the far side, we were soon below the rock step. The weather now took a turn for the worse, in particular as we turned the corner (going left) to locate the exact spot from where to start the climb. The wind picked up, as did the intensity of rain, clearly this had to happen just as we entered climbing mode. Pål Jørgen started out, while I belayed him from below the rocks. 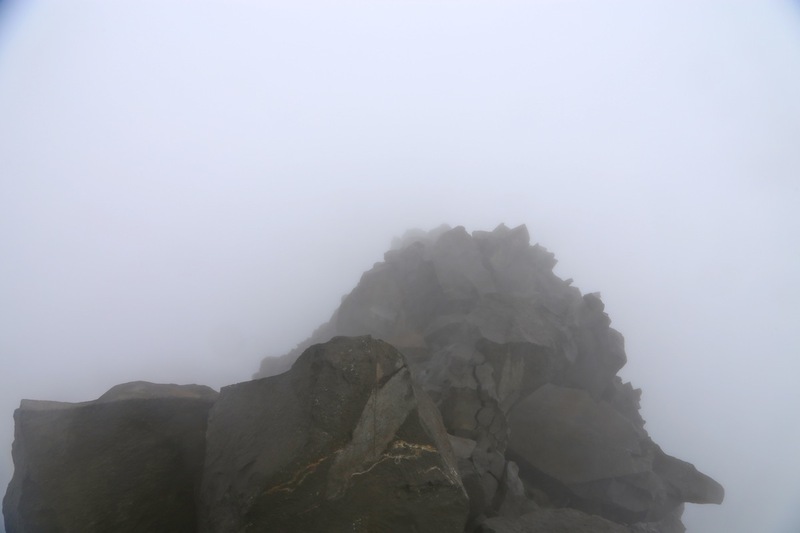 He quickly advanced up the first part of the chimmney, then disappeared in the fog and rain. Progressed slowed, as he explored the route higher up. With all this water coming down, clearly also the climbing and route finding became more challenging. I got a bit cold and hoped that I could soon move. I noticed that more rope went out and assumed that he would soon be up. Suddenly, several small rocks came shooting down, happy to wear a helmet, I quickly moved right in order to find natural protection. Finally, the rope was pulled from above and I knew that I could move. The wind made it impossible to communicate by voice, even this relatively short distance. I moved fairly quickly up the first part, then the terrain got steeper and more care was needed with smaller, wet footholds. I soon arrived onto a good shelf on the right side, observing that the route now traversed around a big block to seemingly better ground on the left side. This traverse was protected by a friend placed directly under the big block. I unclipped, then hesitated a bit since handholds on the boulder I needed to pass, were less than perfect. The whole move was easier than it looked and I shouted to Pål that I was now above the friend, receiving the encouraging reply that most difficulties would then be behind me. As it turned out, there was a final step up onto a slightly sloping rock with loose material on top, this explained the rocks that suddenly had come down earlier. With the wet conditions, and lack of footholds, this seemingly trivial, final move required more effort than it deserved! We left the rope behind and hustled uphill on an easy zig-zag path, then more gently along the top ridge (snow on our right side) to the final summit pyramid consisting of large boulders. We were at the summit at 1130, the weather remained bad and we left after 15 minutes. There is a summit register on this summit, but the book was soaked and I did not want to destroy it by trying to sign the completely wet papermass. 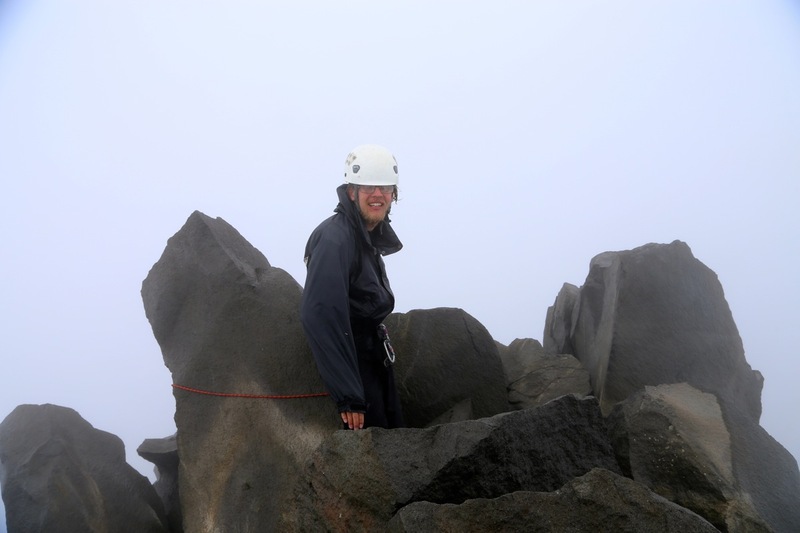 The abseil down the rockstep made us leave several slings and one binder (we made a priamry as wella s a backup anchor). The abseil itself was slightly troublesome as the strong wind carried the rope across several cliffs instead of hanging nicely down the chimney. I had to stop several times on my way down to pull the rope over and there was a real danger that it could become stuck across rough terrain on my left side (when facing downhill). It all got sorted out and then Pål followed more easily. We continued downhill and were back at the shelter around 1415, a short break then 2 more hours back to the car, including a stop to talk with the Conaf ranger and fill out the registration protocol. 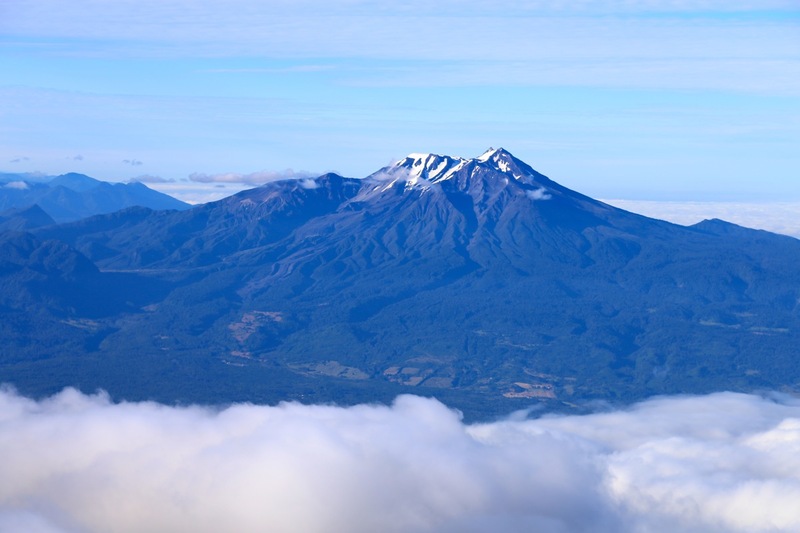 He was somewhat surprised to hear that we had climbed the Calbuco under such bad conditions. 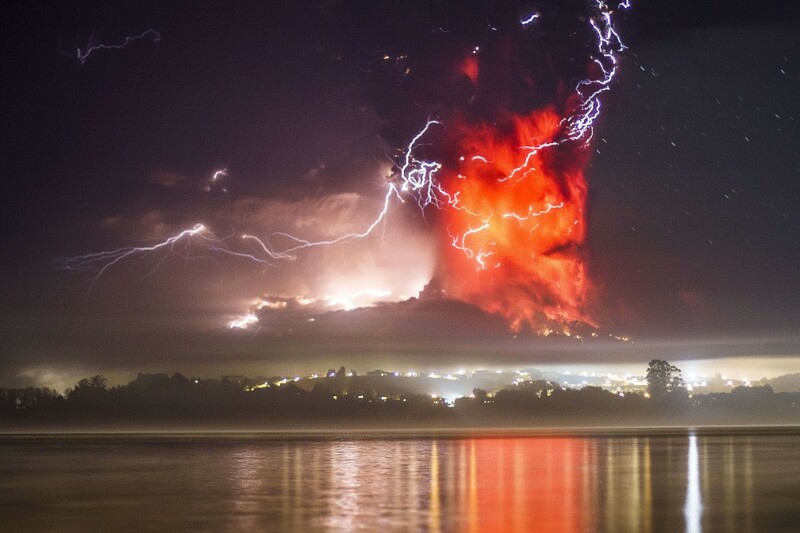 Calbuco, as seen the day before from Osorno. 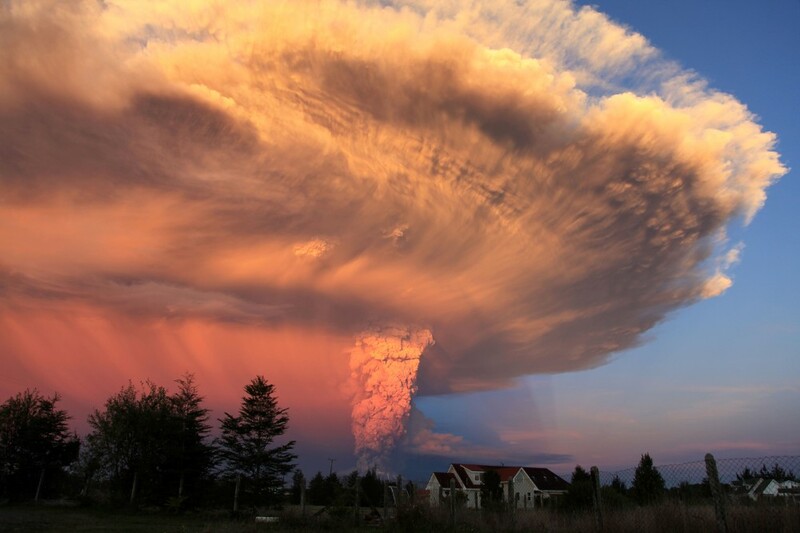 Calbuco going into the clouds. Terrain near the Calbuco shelter. The summit, as seen from the SW ridge. Photo credit: Rob Woodall, Jan. 2014. The rock step, our climbing route is just around the corner, left. Photo credit: Rob Woodall, Jan. 2014. 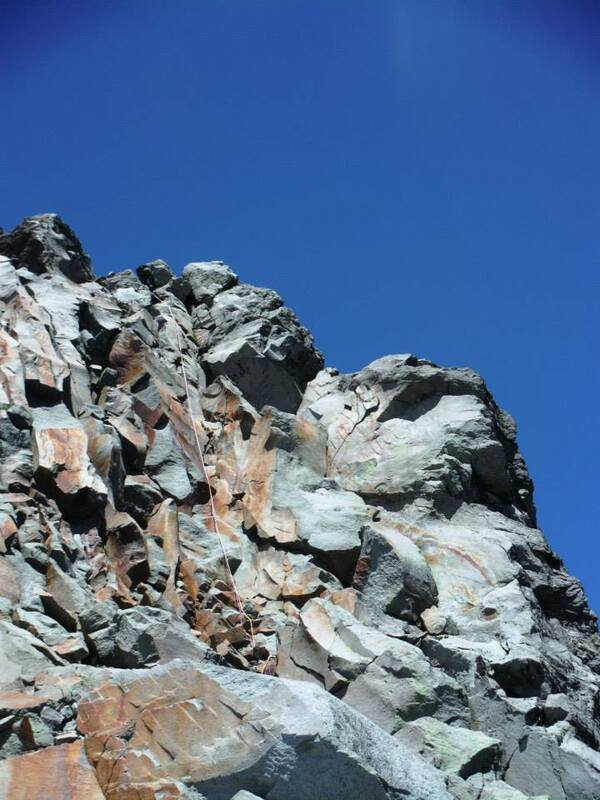 The rock climb, this picture was taken in January 2014. Photo credit: Rob Woodall, Jan. 2014.